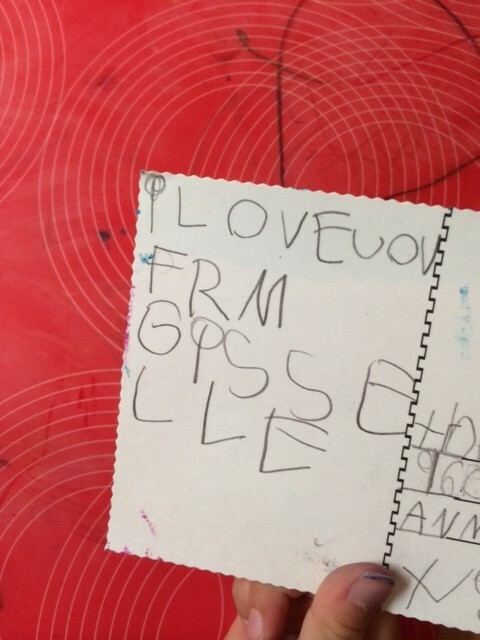 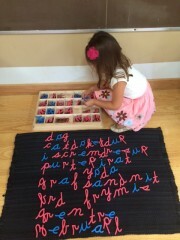 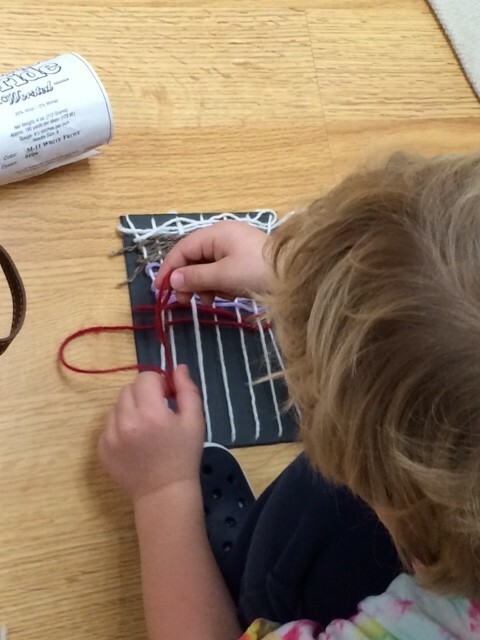 In Montessori, writing comes before reading. 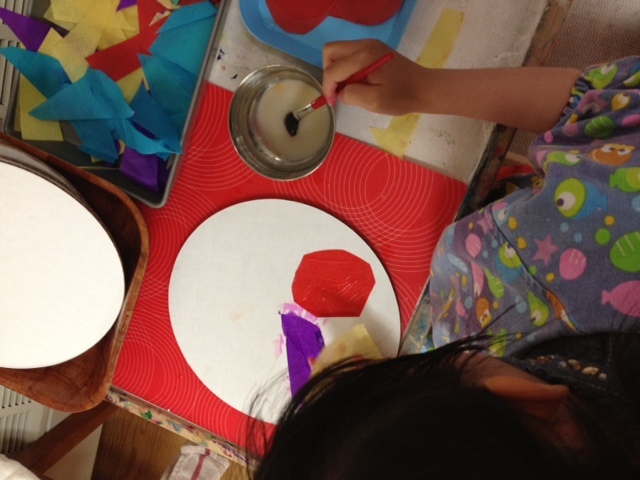 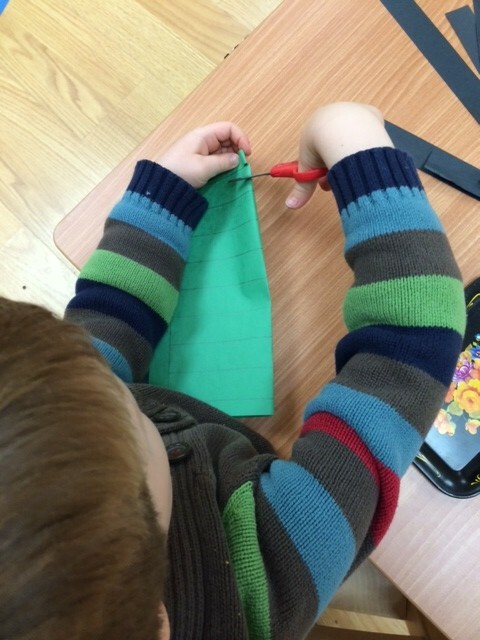 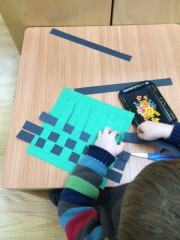 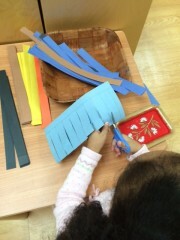 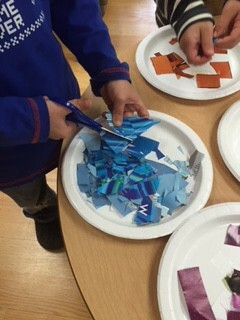 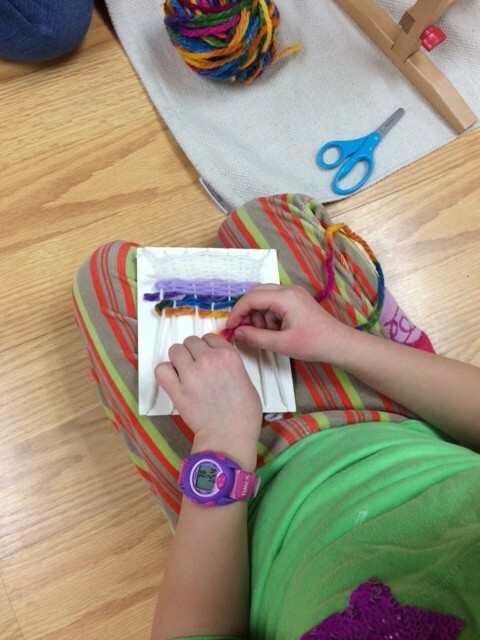 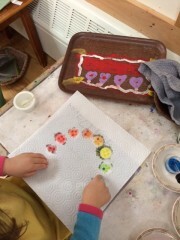 Children learn through their senses and begin by tracing sandpaper letters. 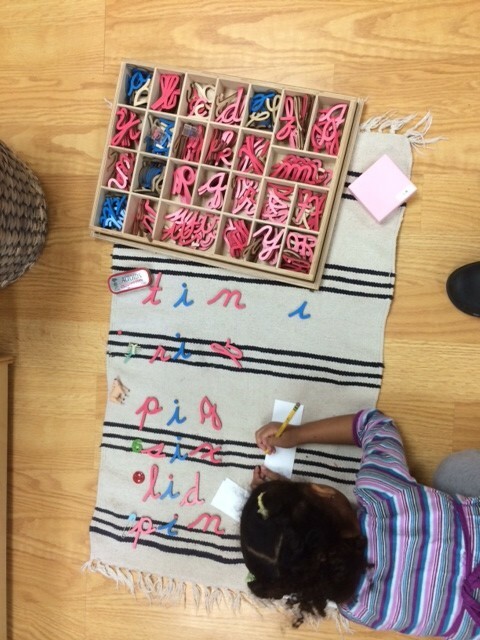 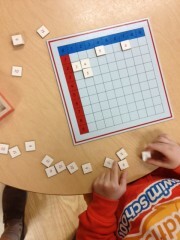 This helps them to learn how to form the letters as well as what phonetic sound goes with each letter. A child practicing the K in his name. 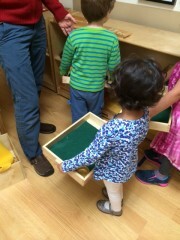 We are also child driven. 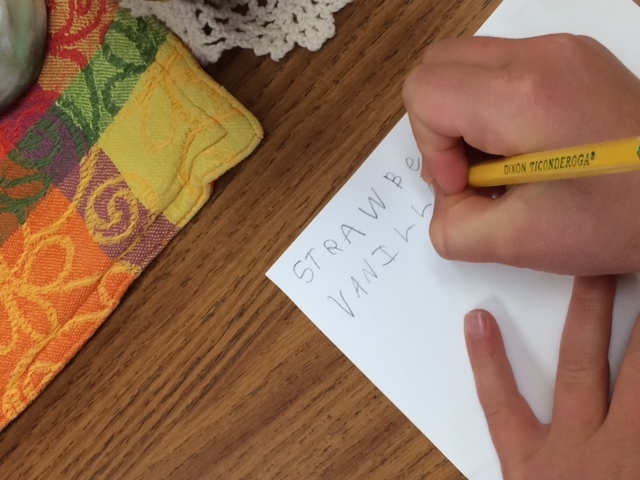 Although we teach cursive, most children learn how to spell their name with printed letters. After children learn the sounds of many letters, they begin to sound out words on their own but also can sound out three letter phonetic words. 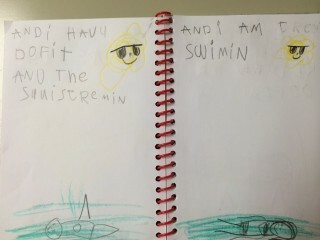 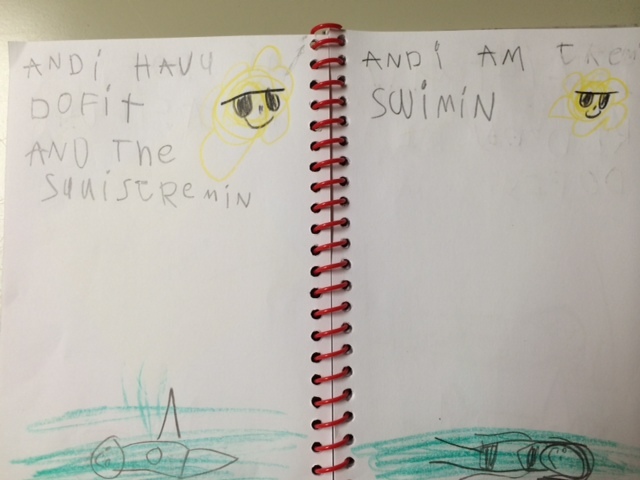 As they become more proficient writers, they begin to write in their journal. They can write whatever they would like. Some kids liked to write real stories like what they had for dinner, some professed their love for their parents and some liked to look at cards and make up a fairy tale. 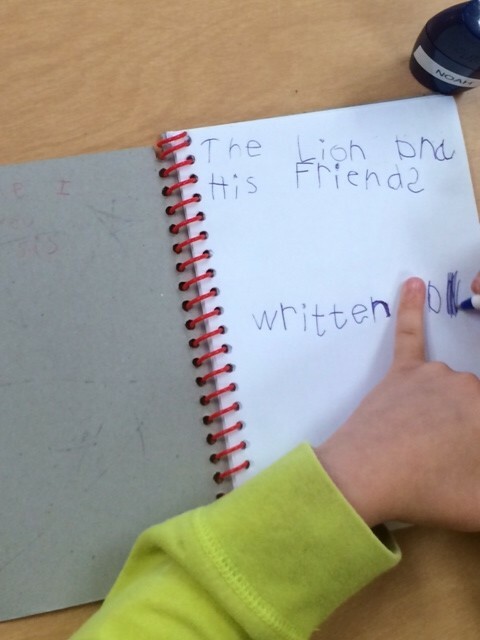 As the children enter their third year (Kindergarten year) we often see spontaneous writing. 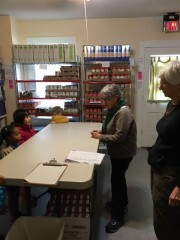 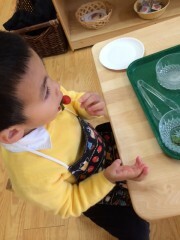 Here a child is asking for what is in the smoothies we made. 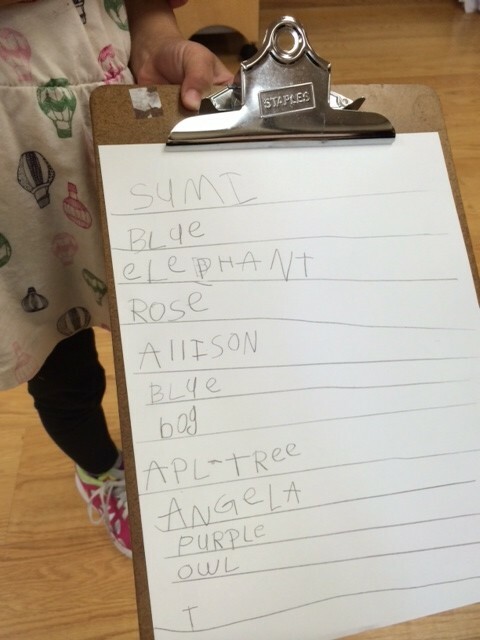 She wanted to write the ingredients down for her mom. 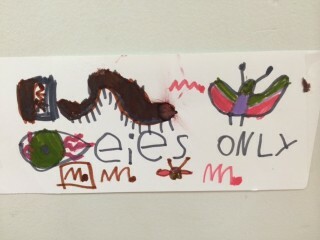 This child made a list “Eyes only” for the chrysalids so their development would not be disturbed and they could finish the process of metamorphosis. This child wanted to make a list of what the teachers liked. 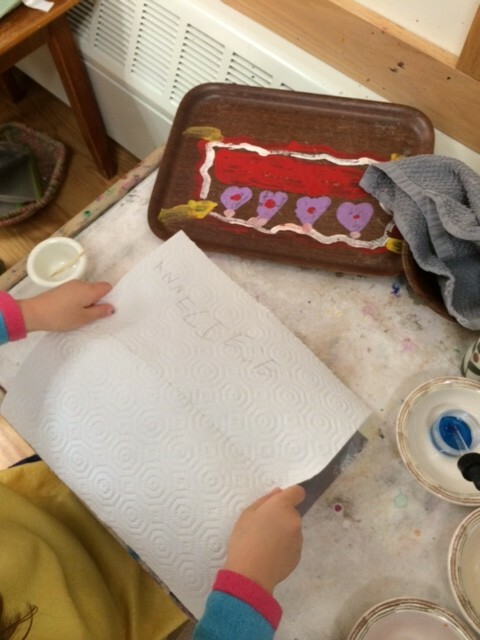 Some of the afternoon children wrote postcards home. 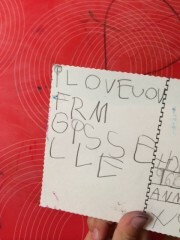 Hopefully they were received in the mail this week! 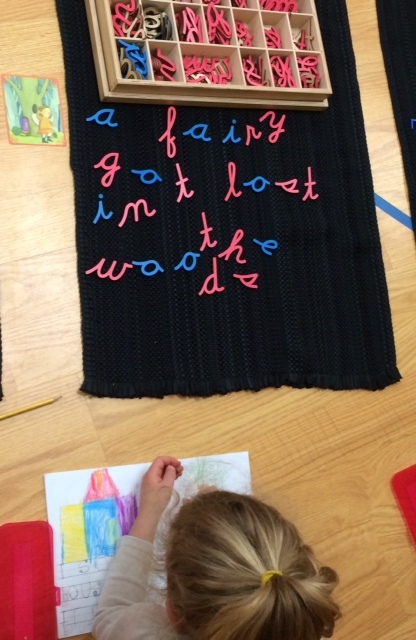 We provide many opportunities for writing in our classroom! It is great fun to watch these skills develop! We continued our cultural studies by investigating Africa and Ancient Egypt. 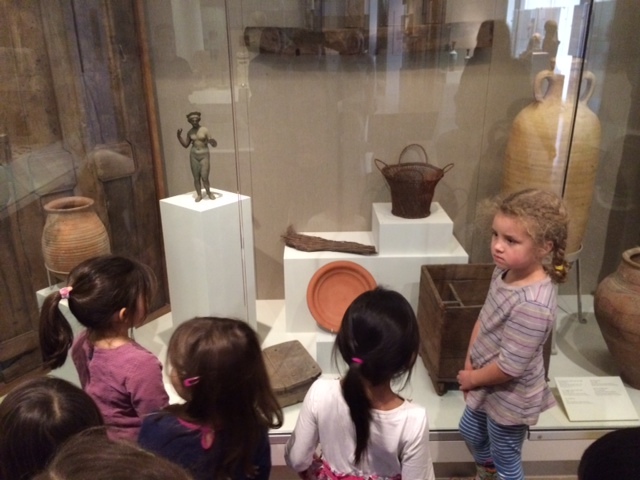 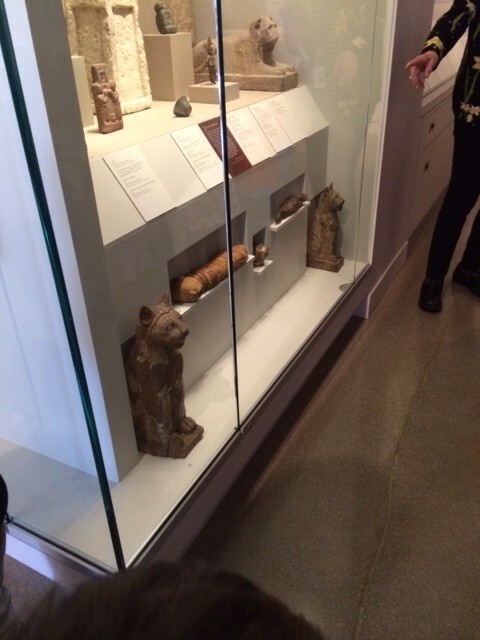 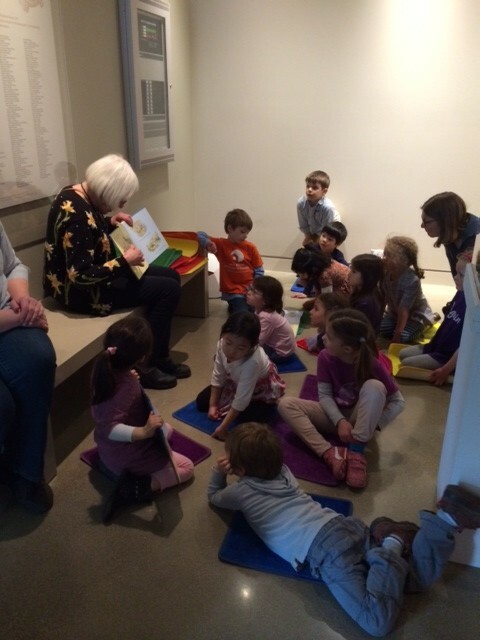 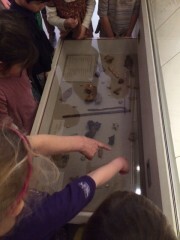 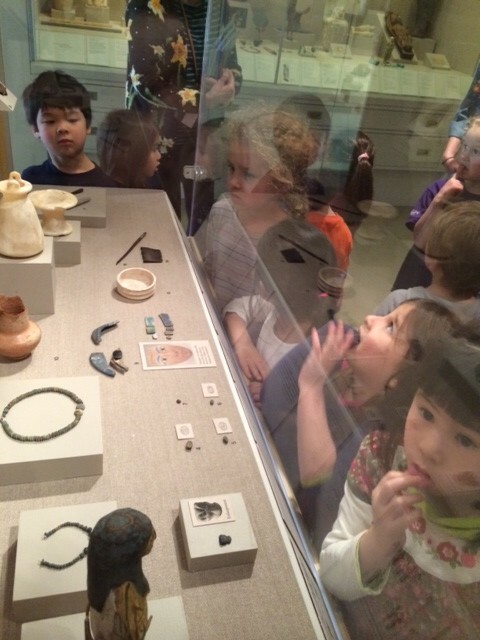 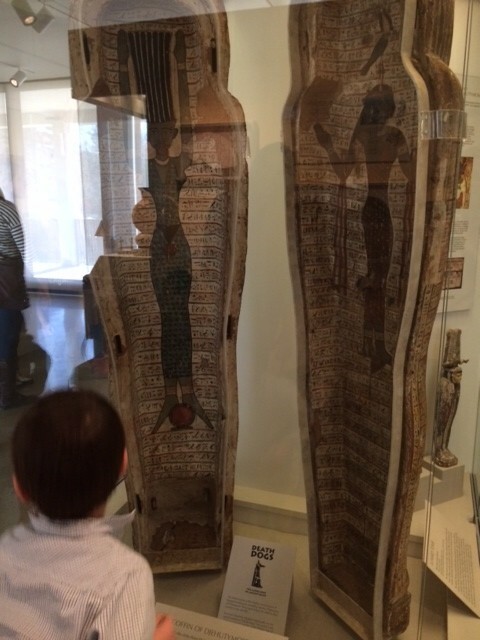 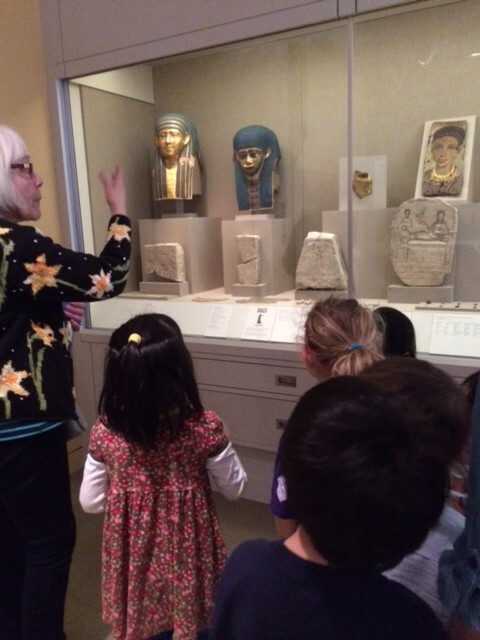 The afternoon children took a field trip to the Kelsey Museum of Archaeology to learn more about Ancient Egypt. 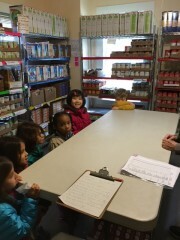 https://www.lsa.umich.edu/kelsey/ This was extra fun and exciting because we took the bus there! A docent met our group and took us around the museum. 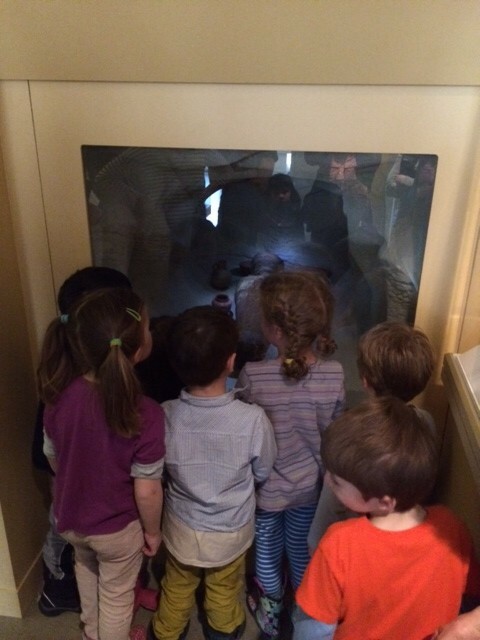 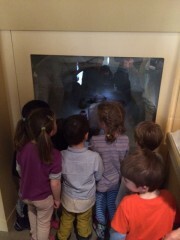 We saw real mummies and tombs. 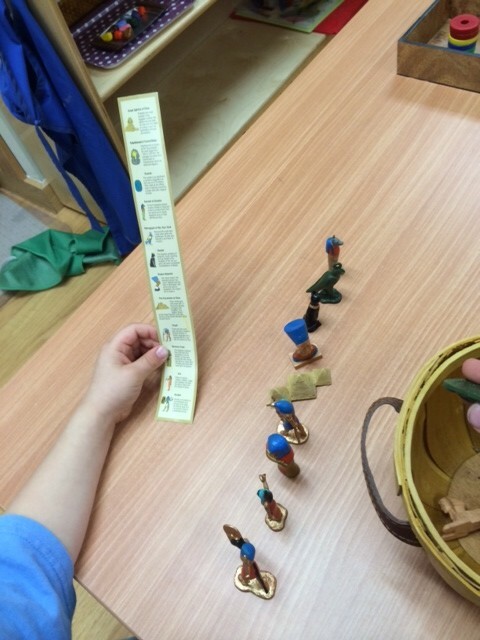 We saw toys children used back then. 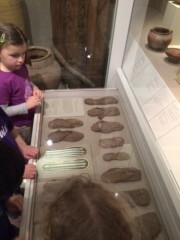 We looked at shoes, jewelry and oil lamps. 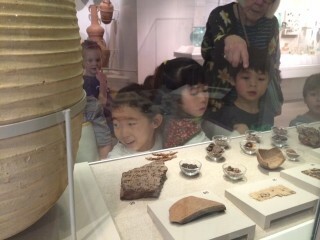 We looked a different types of pottery. We had a great time at the Kelsey museum. 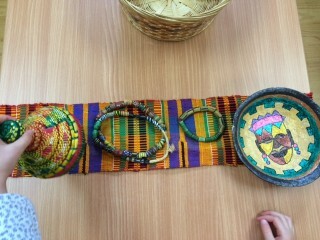 In the classroom we continued to explore and learn about Africa. 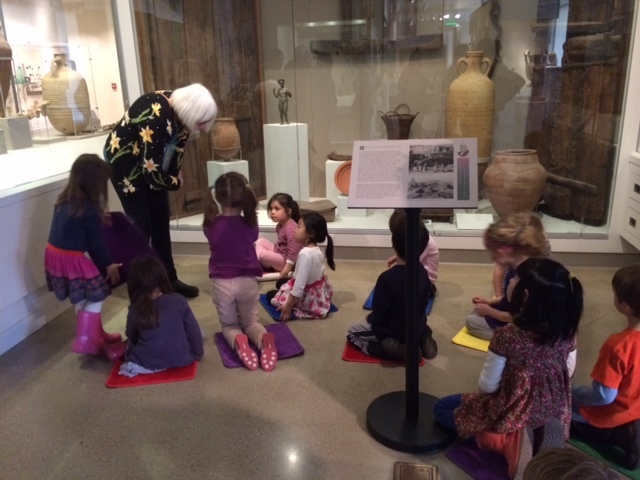 We borrowed a “Civilization in a Crate” so the younger children could also be exposed to Ancient Egypt. 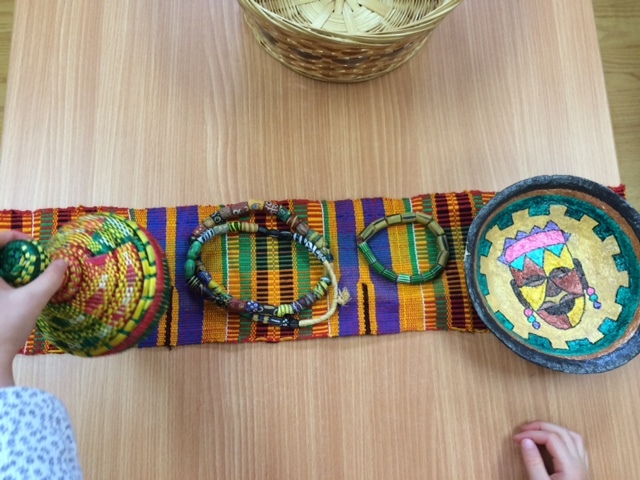 We also had many other African items to investigate. 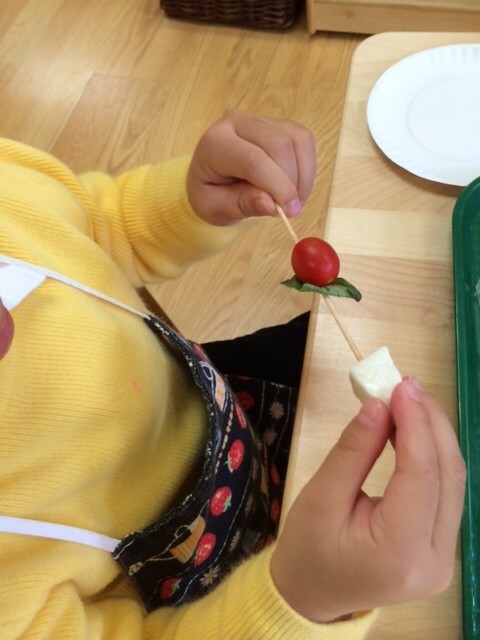 Another way to learn about other cultures is to taste some of the food. 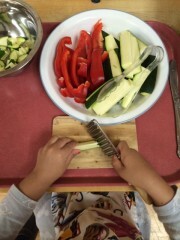 The children helped to make couscous one day. 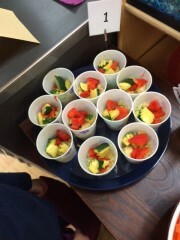 They first chopped the veggies and added them to the couscous for a treat one day. Finally, Lori from Drummunity came to see us again! 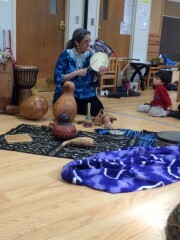 She showed us many different types of clothing and instruments. 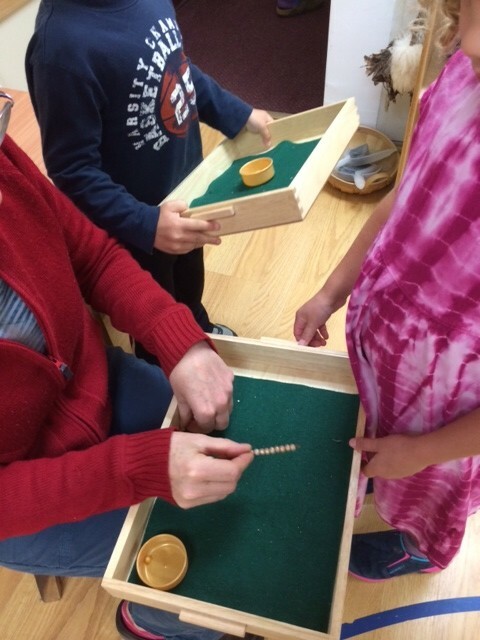 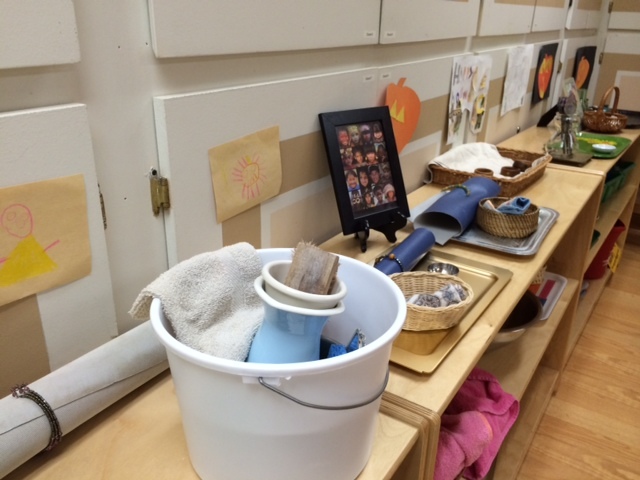 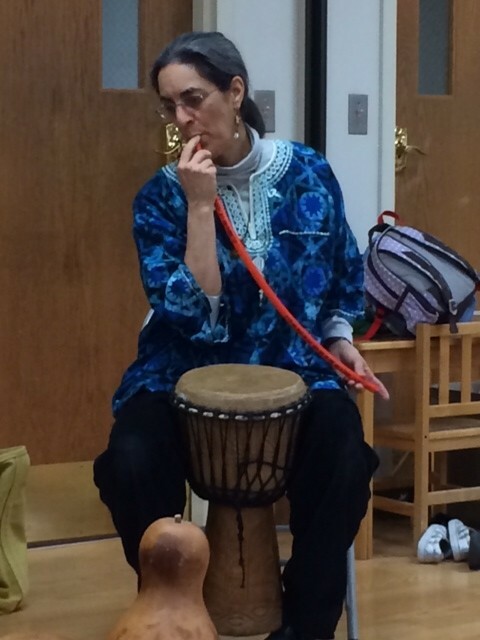 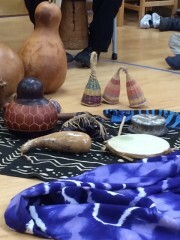 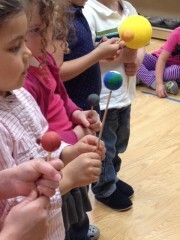 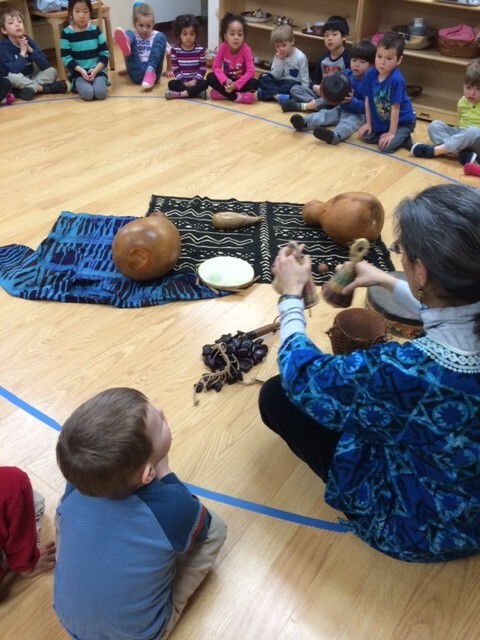 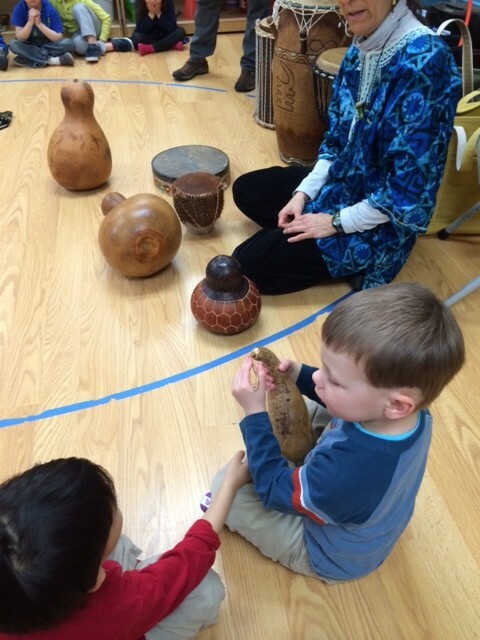 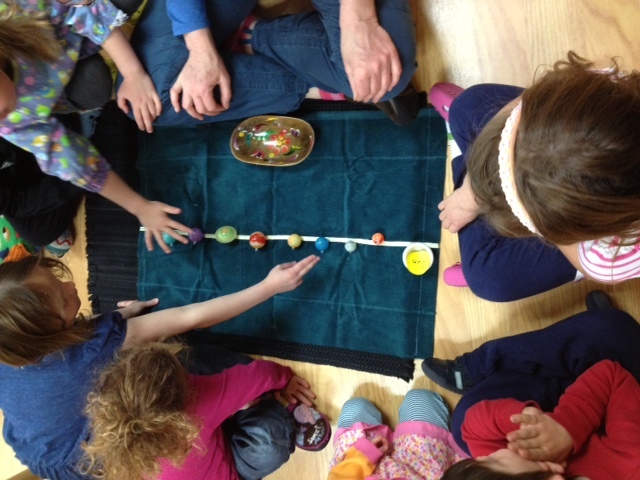 The children were able to explore and Lori helped explain what these instruments were made of and how to play them. Thanks to Lori for coming out, to Kelsey Museum of Archaeology and to all the parents who went with us on the field trip! Better late than never! 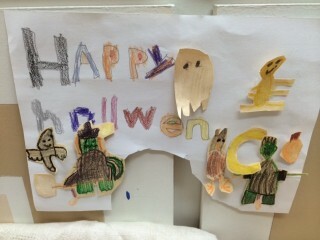 A few short weeks ago it was Halloween. 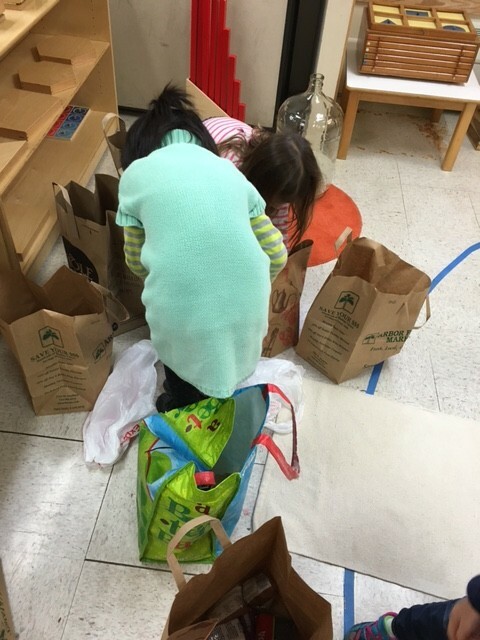 We have a low-key celebration as it can be overwhelming for many children. 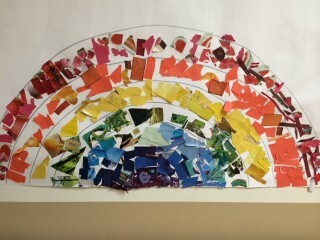 Some of the Kindergartners and the afternooners decorated the classroom. 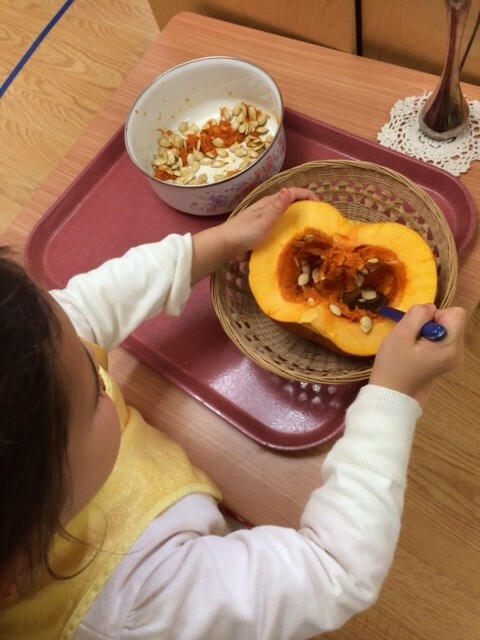 We scooped out a pumpkin to make pumpkin muffins for the classroom celebration. 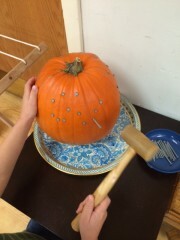 We also carved a friendly jack-o-lantern. We also hammered nails into a pumpkin. 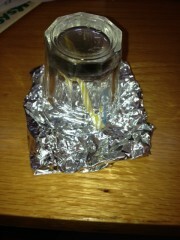 The afternoon children did several experiments where we observed heat energy. 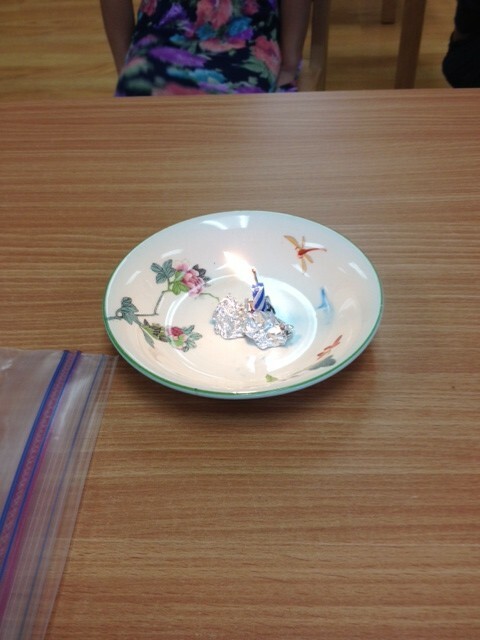 We observed what happened when a short birthday cake candle was snuffed with a small glass. We also observed the same birthday candle burn until the wax was all gone. While carefully observing we talked about what made the candle burn and stop burning. The kids enjoyed examining the cooled (we put it in the freezer) remains of the completely burned candle in the tinfoil which held it. 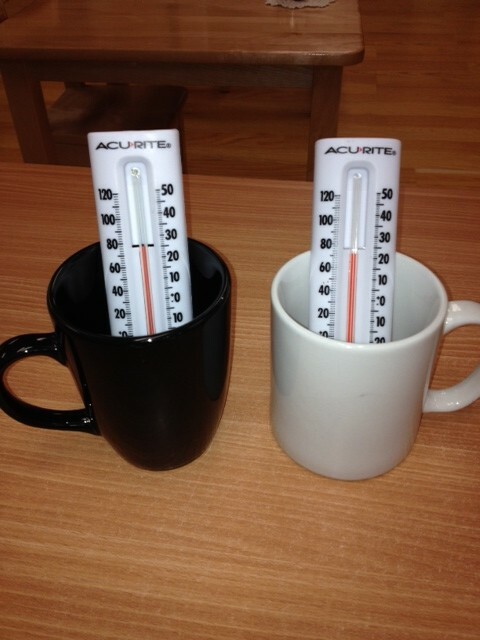 We took advantage of the sunny warm afternoon and observed two thermometers first inside the classroom and outside. 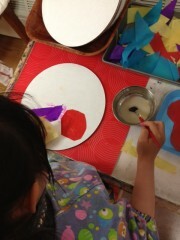 We then placed them in a black mug and a white mug. We also felt the sides of the mugs and observed that the black mug felt much warmer than the white mug. 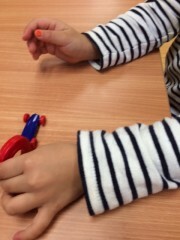 We rubbed our hands together and talked about friction and heat production. It was a fun first full week of school! 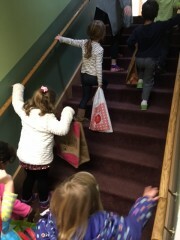 The returning children went back to work right away! 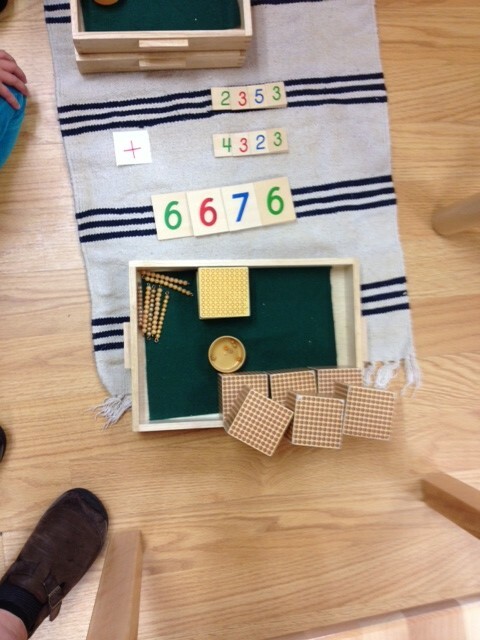 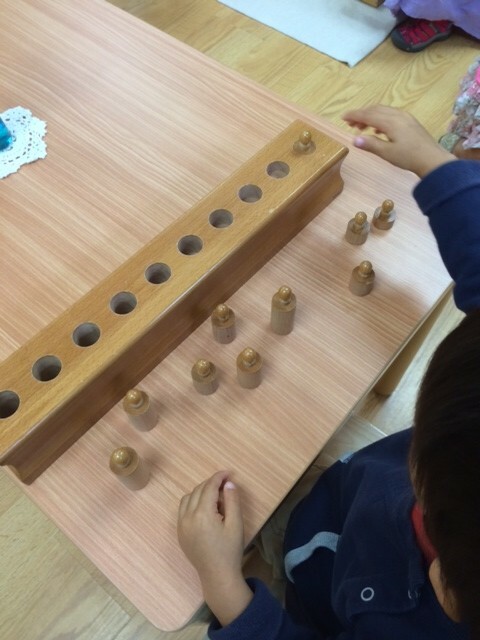 It is lovely to see them rediscovering old works such as mopping, cloth washing, washing a baby and doing addition and subtraction with the stamp game and small bead frame. The new children learned many new things! 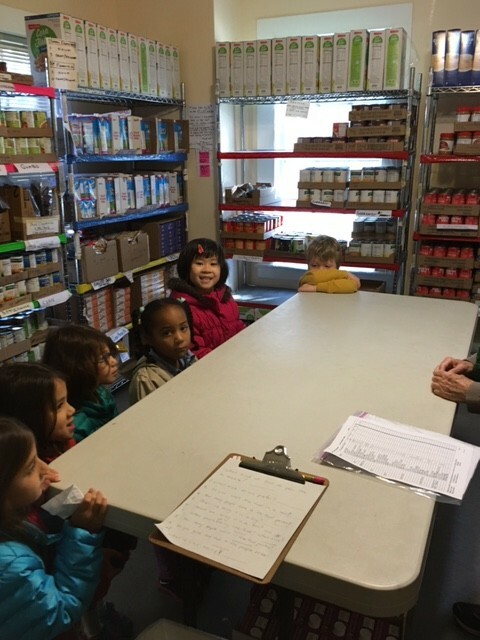 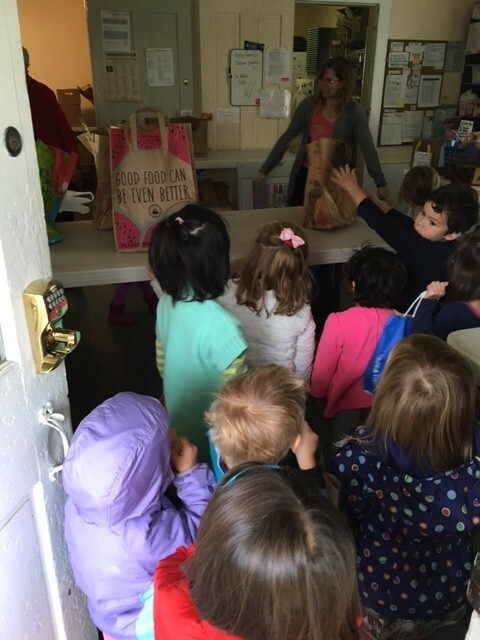 They learned some rules in the classroom (Grace and Courtesy) such as how to walk inside, how to ask someone to move, how to carry a tray, how to walk around someone’s work and how to ask for help from a teacher or older student. 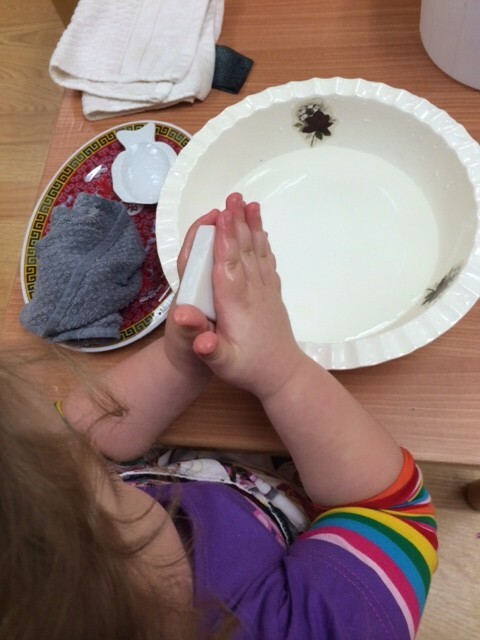 The new children also had lessons in self-care such as how to wash hands, how to get a drink and how to cover your mouth (with your elbow) when you sneeze or cough. Here is a child washing her hands at a table. This week she also learned how to wash her hands independently in the bathroom. 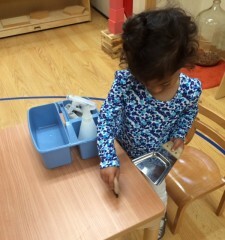 These girls like to clean the tables. 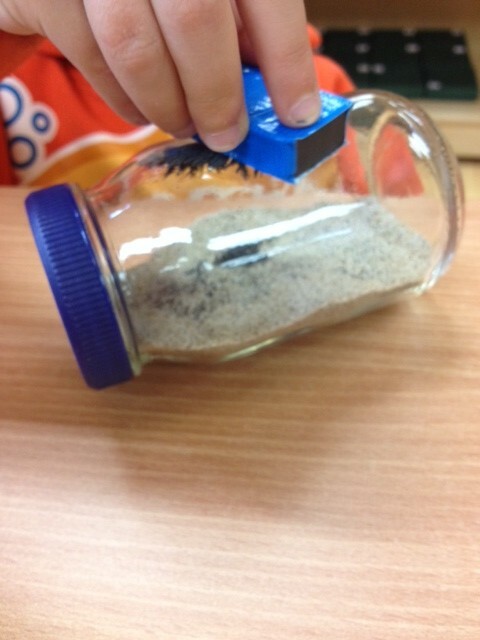 It is such fun to use the squirt bottle! 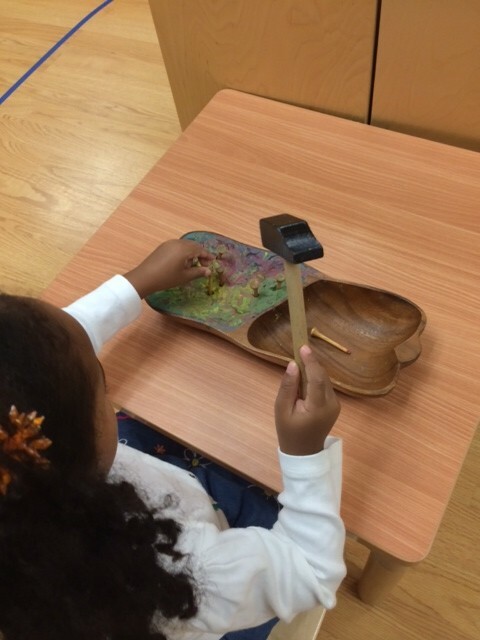 Hammering was a fun addition (golf tees and clay). This child learned to use the cylinder blocks which teach dimension. 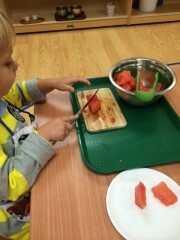 Watermelon cutting was fun and yummy! This child used a dull knife to chop up the watermelon pieces. 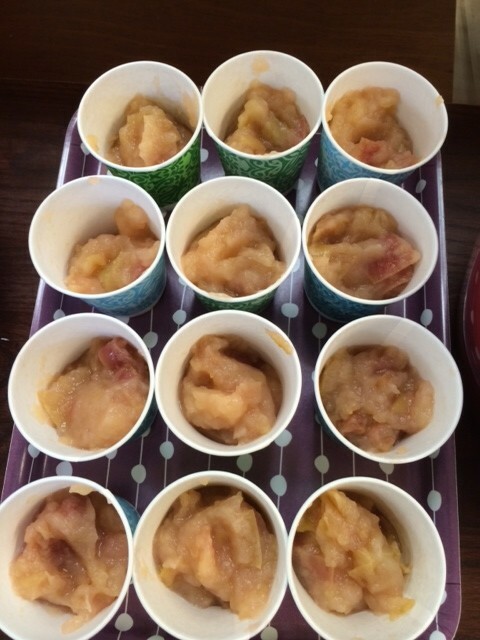 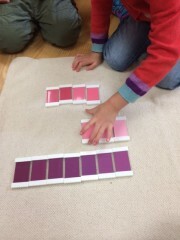 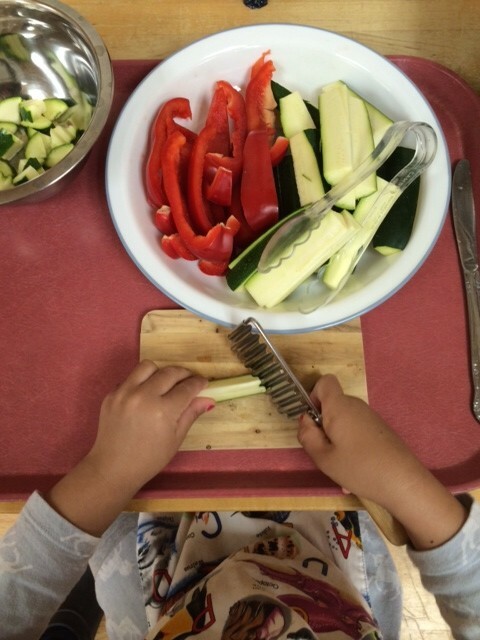 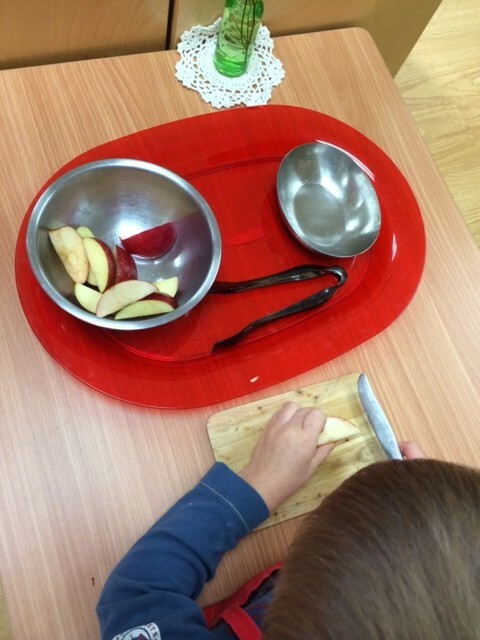 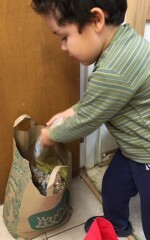 It is a multi-step activity involving: Carrying the tray to a table, putting on an apron, washing hands, using the tongs to put the watermelon on the cutting board, cutting, moving the pieces to a plate, eating, throwing away the plate, putting the tray on the shelf, pushing the chair in, taking off apron and washing hands again. 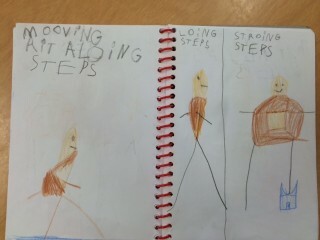 Many steps to remember! 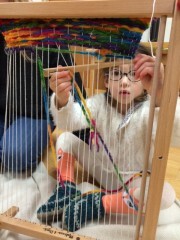 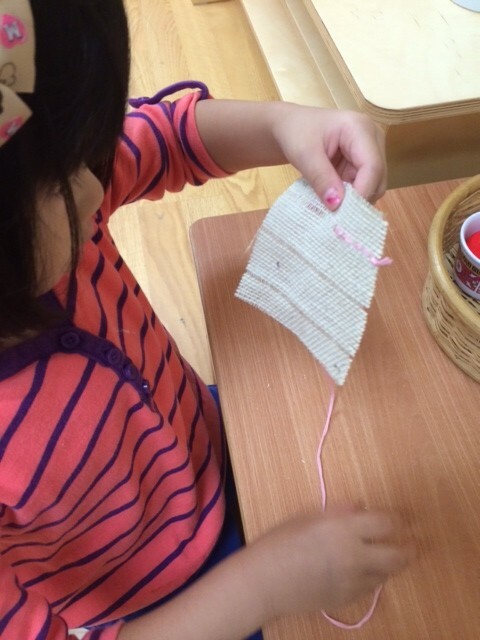 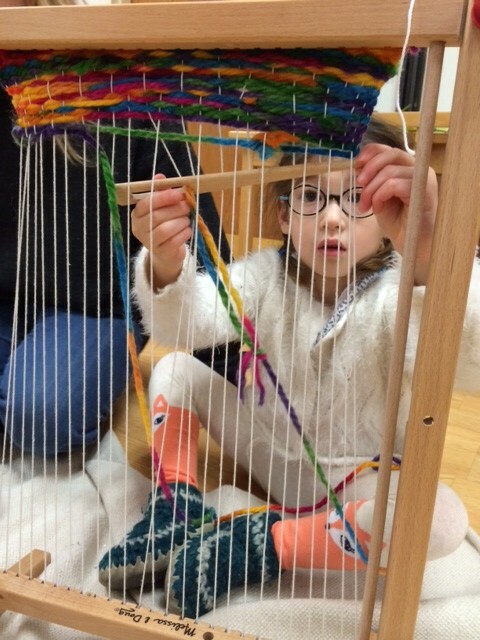 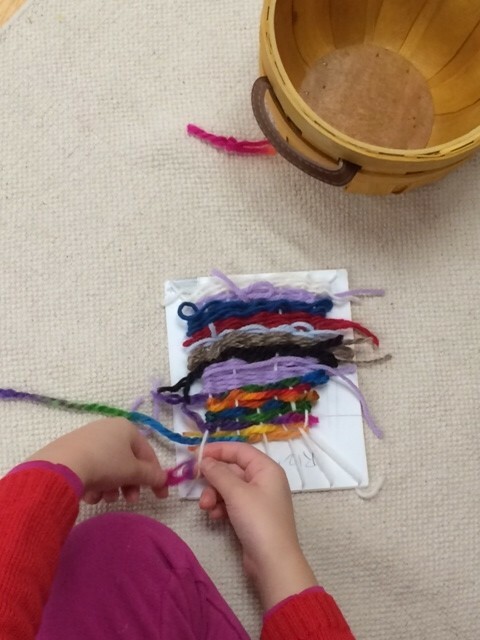 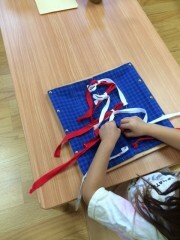 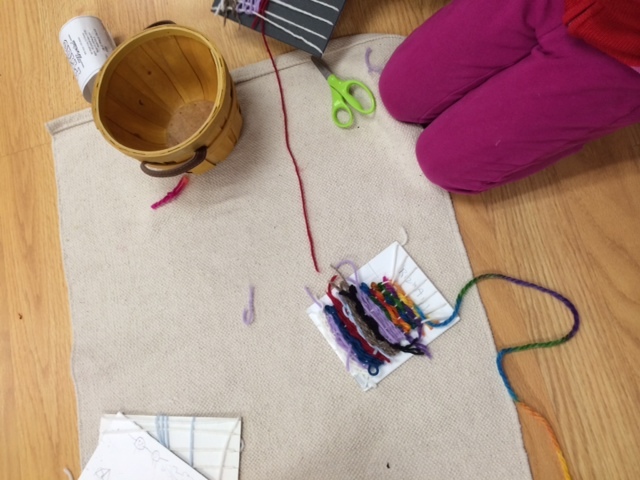 A returning child enjoyed sewing a straight stitch on burlap. 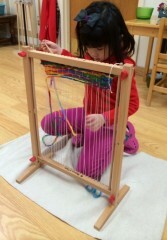 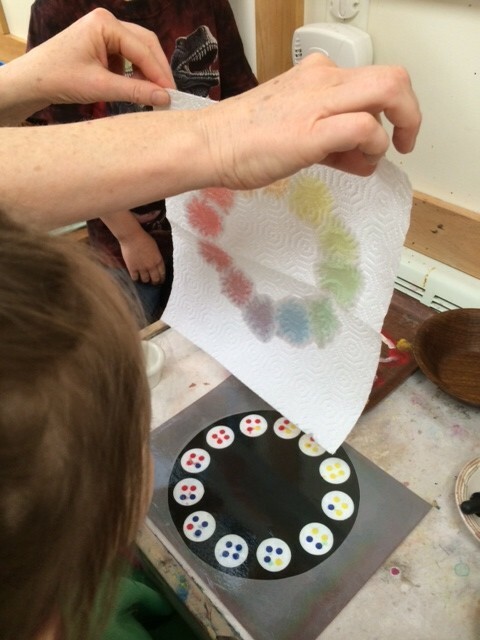 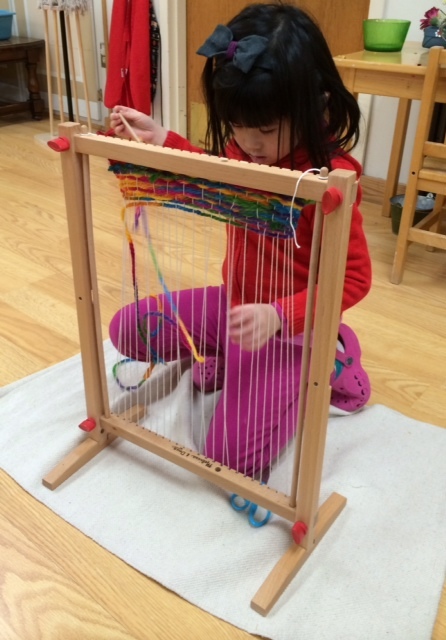 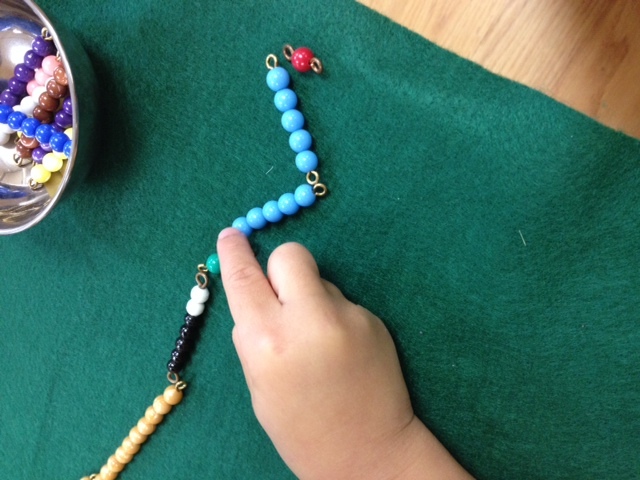 For the new children we have bead stringing as well as sewing on a piece of vinyl. 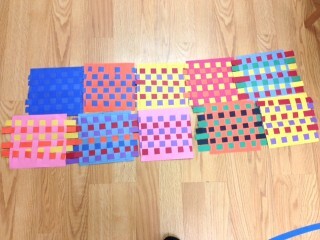 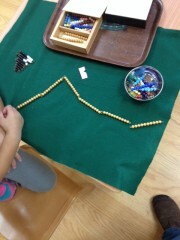 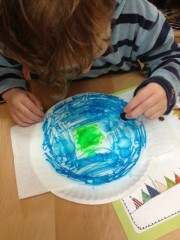 They progress to this type of work once their fine motor skills have grown. We talked about living things (a hamster) and non-living things (a table.) 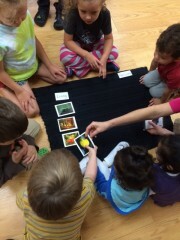 We sorted picture cards into living and non-living categories. We labeled the room with labels which read “living” and “non-living.” Three afternoon children were inspired to make their own books that listed living and non-living things they found in the room! 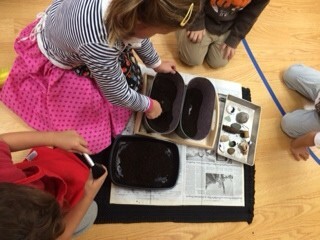 We went on a “dig!” Children dig and then dust off dirt to discover a fossil, artifact or rock/mineral. 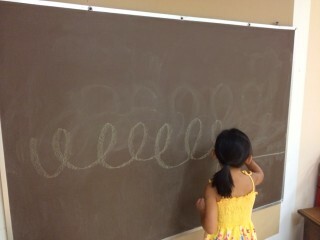 The children seem very accepting of our transition to teaching cursive letters. 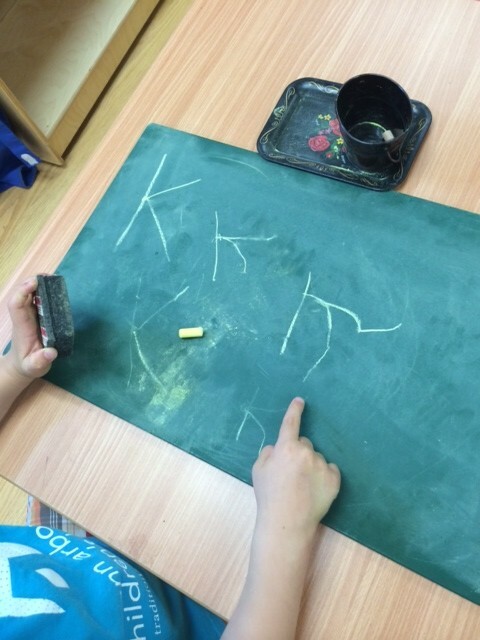 Some have written words with one of our three beautiful new cursive moveable alphabets and others have enjoyed writing the letters on the large chalkboard which is now lowered to their height. 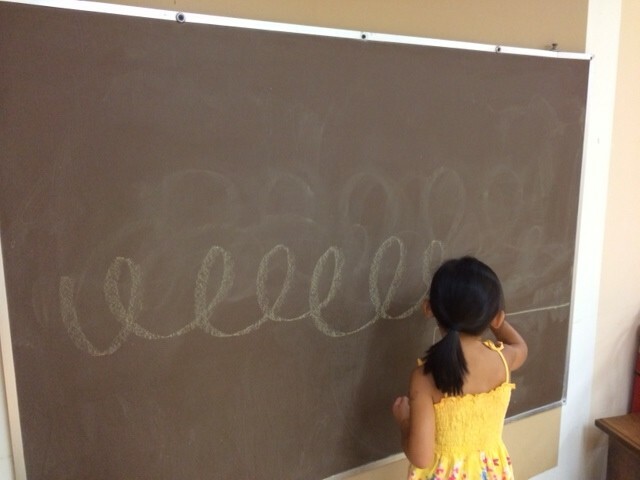 Taking the “chalk for a walk” involves holding the chalk sideways and using the whole arm. 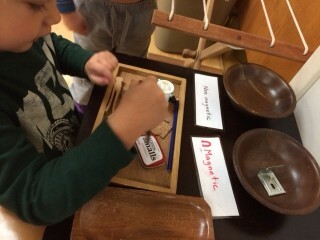 This prepares the arm and hand for writing. 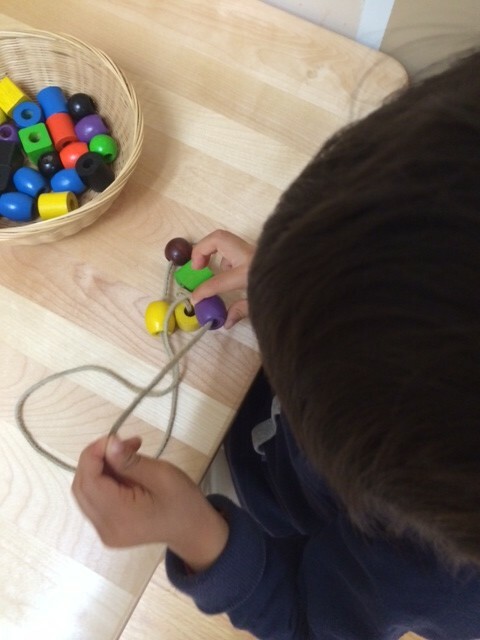 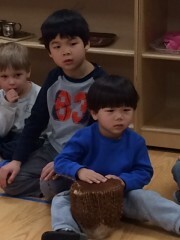 Dr. Montessori was known to talk about how the muscle memory digs the deepest groove. More on cursive in upcoming posts. A child has traced the “t” and can now practice on the chalkboard. 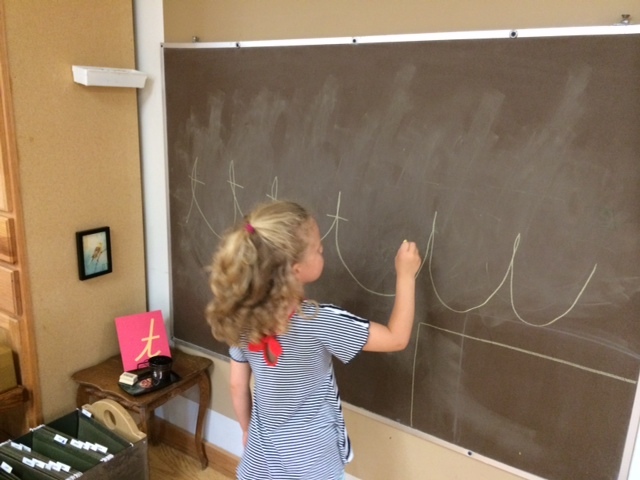 The next work for this Kindergartner is to practice on a tabletop blank chalkboard then a lined chalkboard before moving to paper. 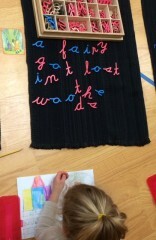 Writing this way becomes finer as the child gains more control. From the whole arm (at the chalkboard) to the elbow down (table top chalkboard) to the wrist and fingers (paper). 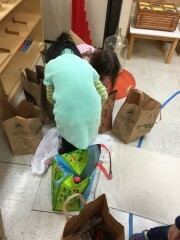 The Kindergartners this year are taking an active role in preparing our room for lunch. 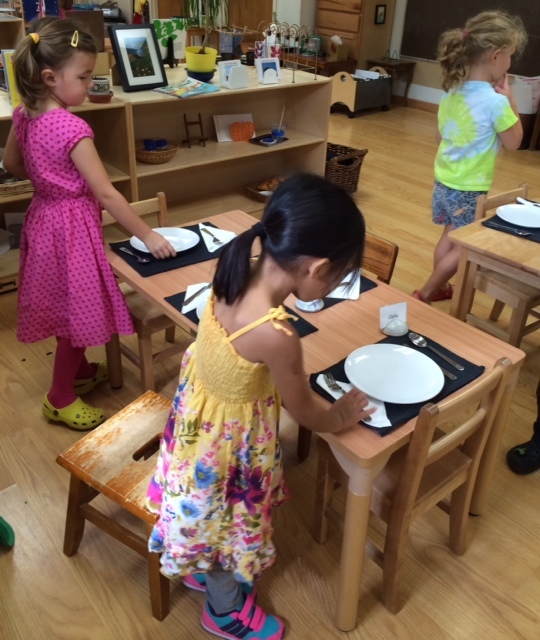 We are now using placemats along with our dishes, silverware and drinking glasses. They are so excited when it is time for them to set the tables. In one week they have begun to take charge of this and will be independent soon. We were able to play outside every day except one due to pouring rain. 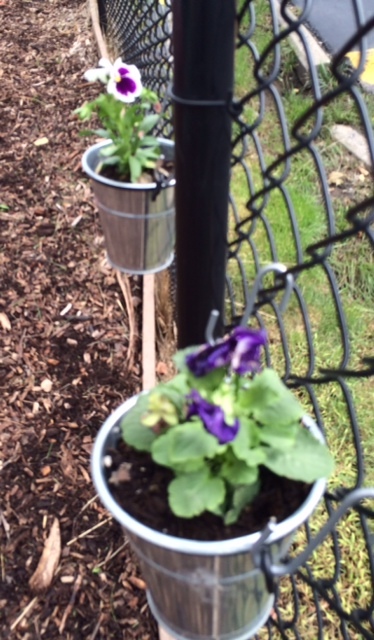 We planted pansies! 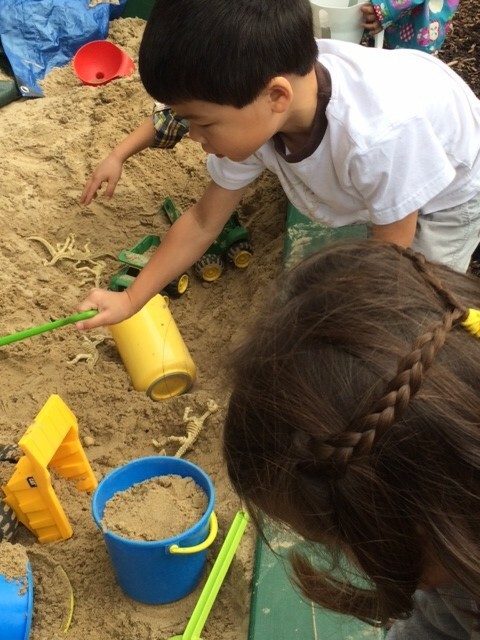 We dug in the sandbox and so much more! In Physical Science we explored three states of matter: solids, liquids and gasses. 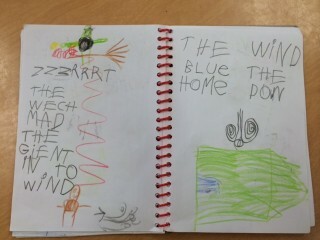 We read an excellent book entitled “What Is the World Made Of? 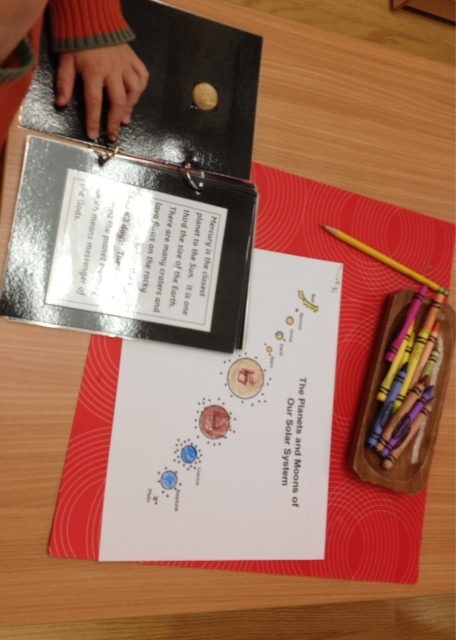 All About Solids, Liquids, and Gases” by Kathleen Weidner Zoehfled. We turned a liquid into a solid by making lemonade popsicles and observed (from a safe distance) a whistling tea kettle boil a liquid and turn it into a gas. When we teach science we strive to be inquiry based rather than didactic. 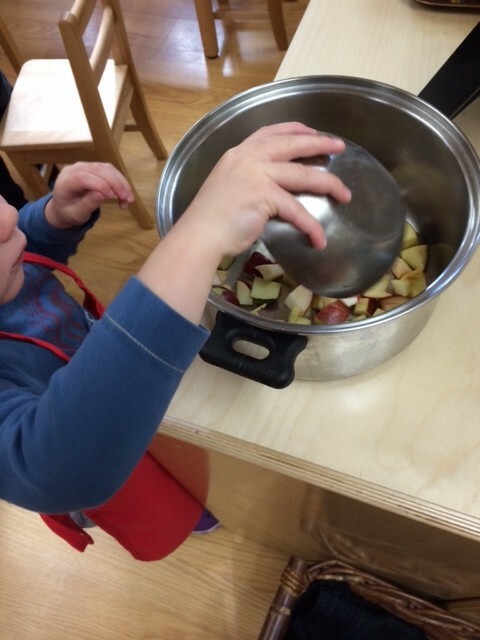 When we observed that the cooled tea kettle no longer contained any water, instead of telling the children “the water turned from a liquid state to steam” we asked them where they thought the water went. 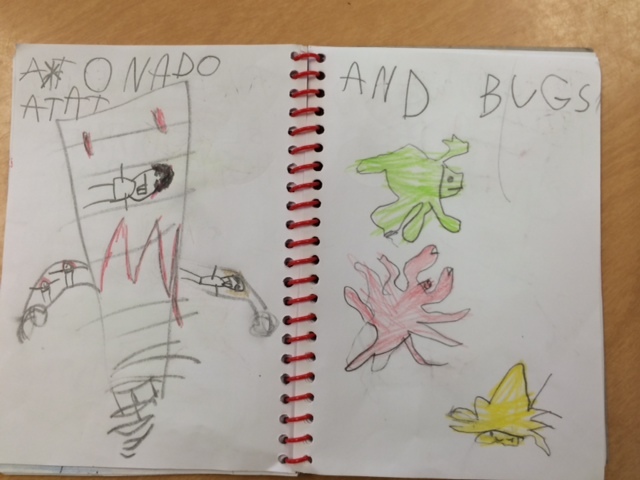 It was great to hear their thoughts. “In the stove.” “In the steam.” We also did an experiment inspired by the book where we opened a bottle of perfume on one side of the room and noticed how long it took for the smell to travel to the other side of the room. The children have had a great time learning about our solar system. 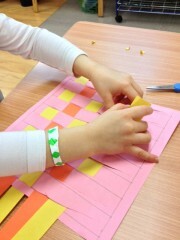 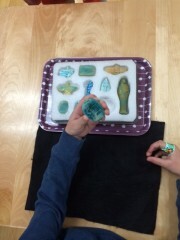 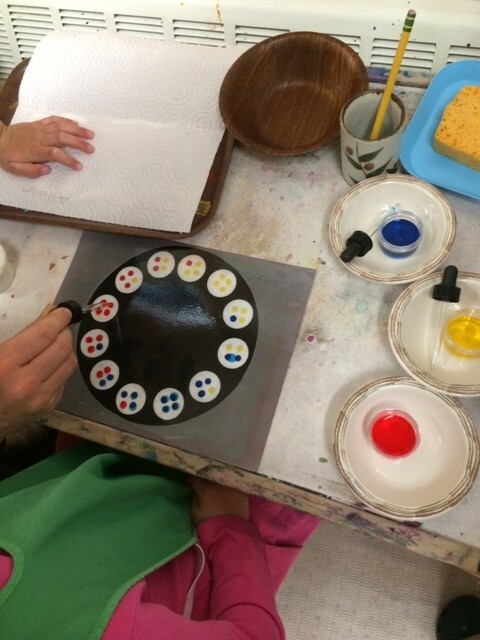 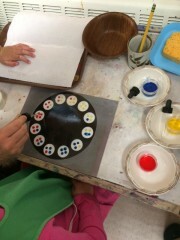 We have many hands-on models, books and activities. 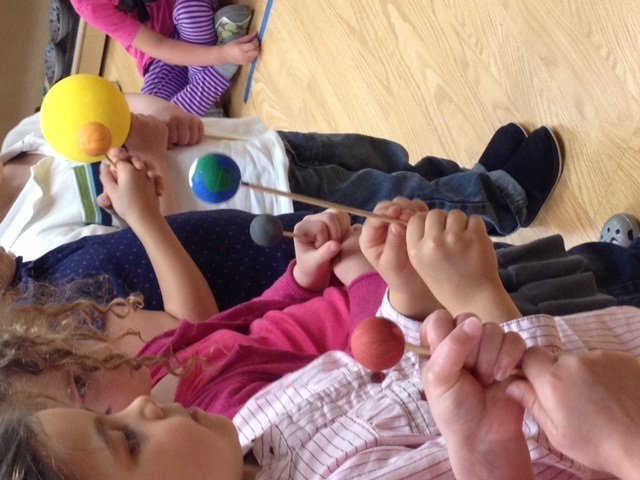 We sing songs and alter our birthday song (“The Earth orbits the sun, the Earth orbits the sun, it takes 365 days, the Earth orbits the sun.”) to include the other planets to learn how long their orbits were around the sun. 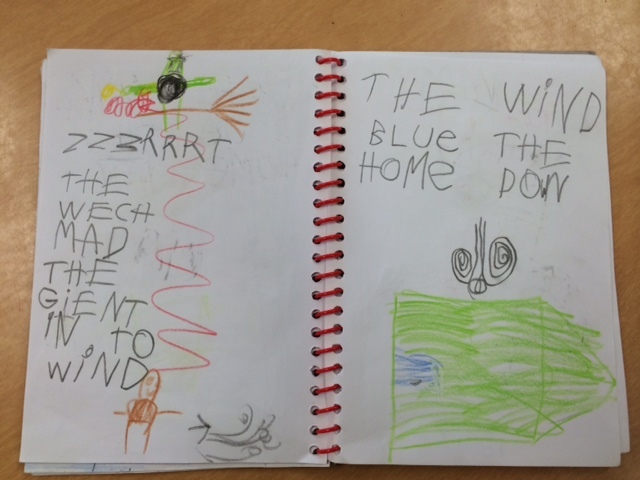 Some children chose to make their own book to take home. 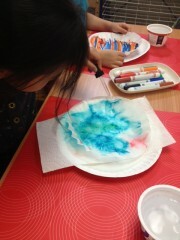 Some children used liquid starch to make a Jupiter with the 300 year old storm. 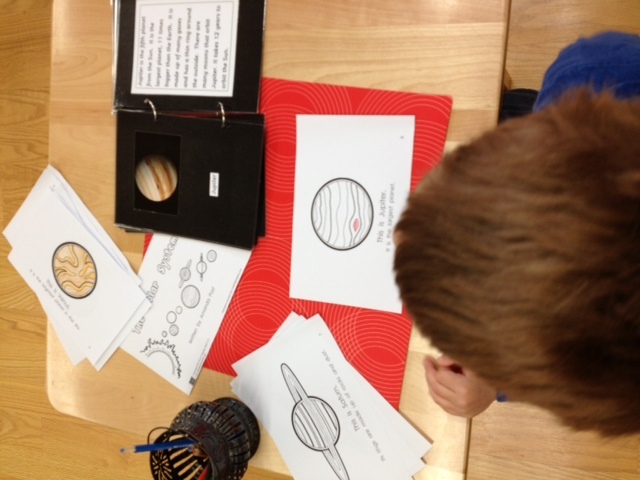 Some colored the planets with their moons on paper. 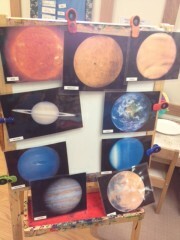 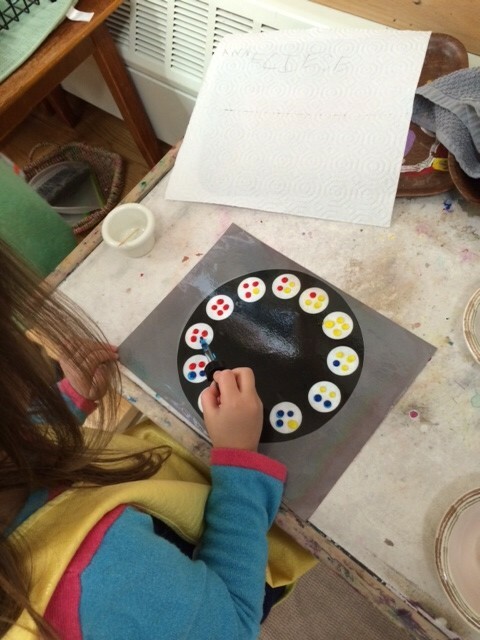 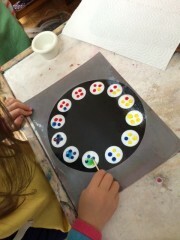 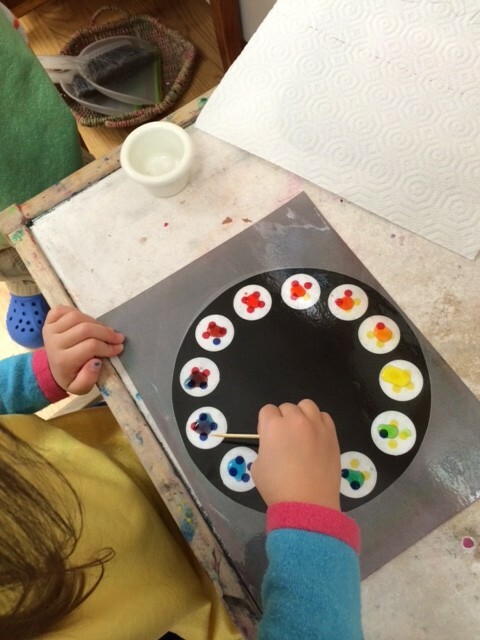 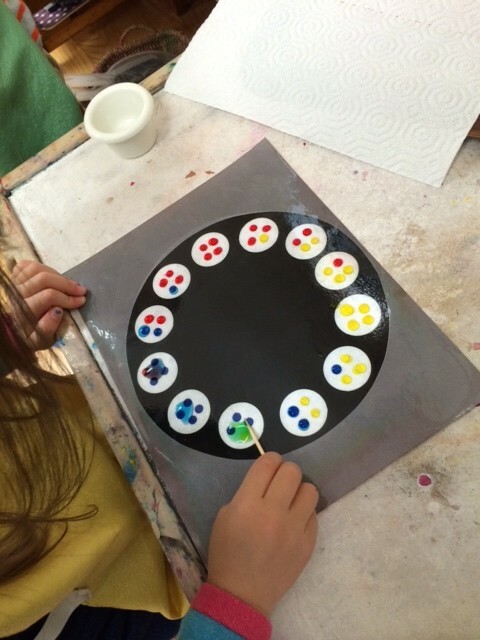 In Friday afternoon art, the children looked at the planets. 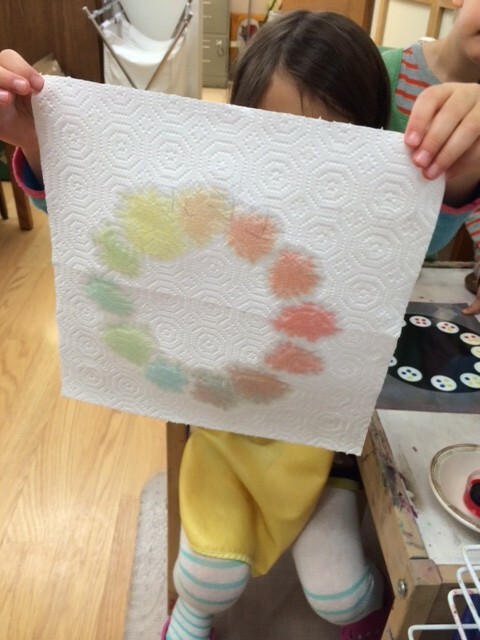 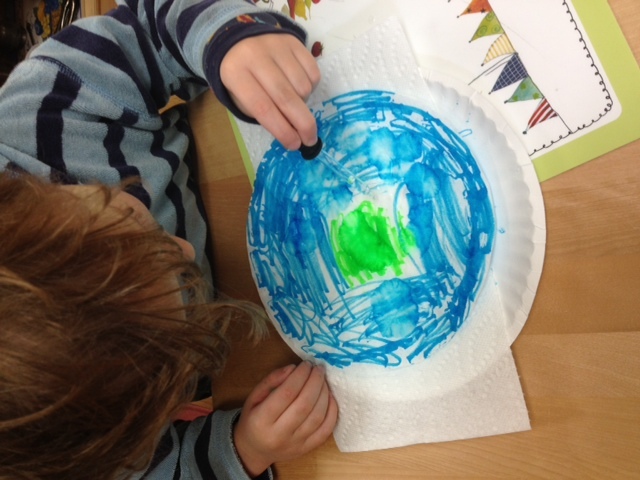 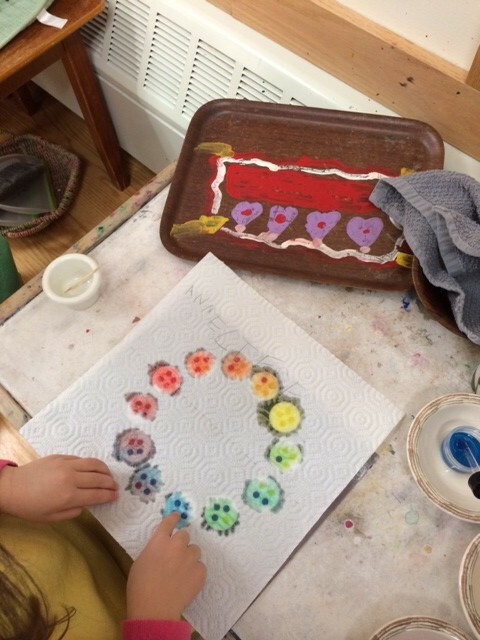 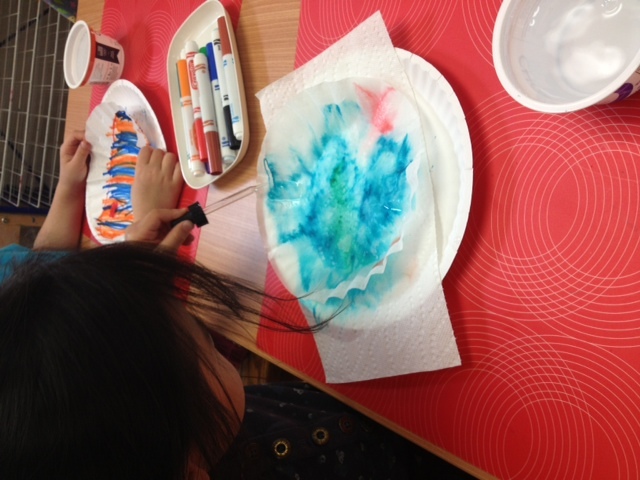 Using a coffee filter, markers and drops of water, the children create their own planets. 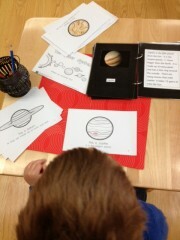 Journey Through The Solar System! 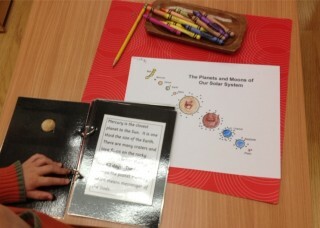 Bring your bike, scooter or walking shoes and traverse the solar system from the Sun to Neptune! 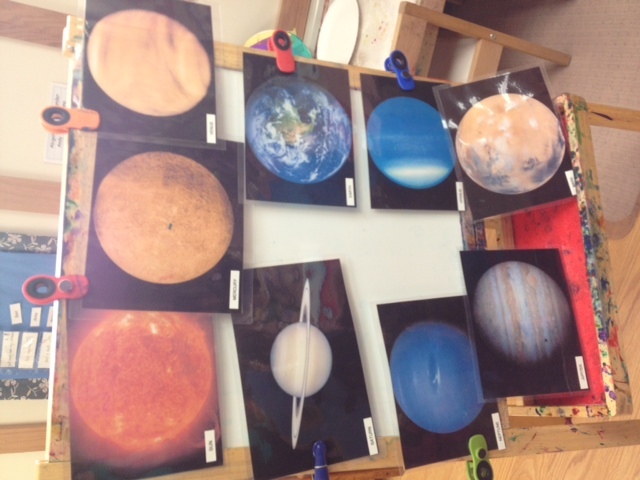 This exhibit features a model of the solar system, scaled to size and distance, along with awesome images and information at each station. 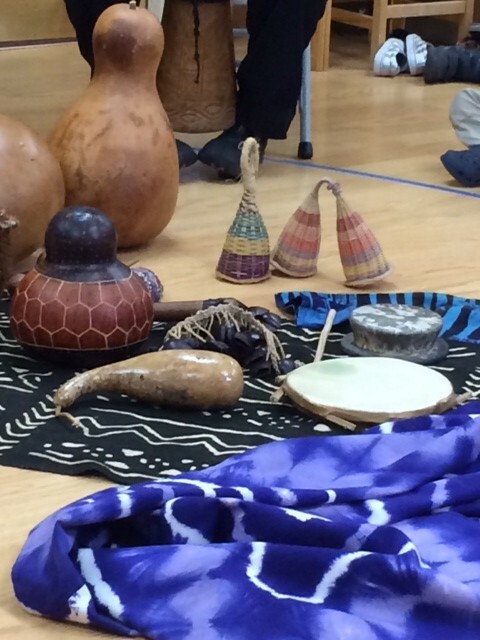 The amazing voyage begins at Mitchell Field and stops near Dixboro Dam, but does not end. 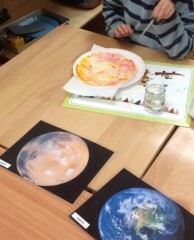 A cosmic perspective will be gained along the way and further exploration is inevitable. 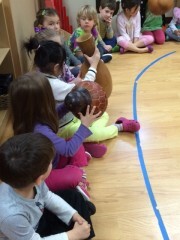 This is a great opportunity to truly appreciate and understand the incredible distances of our tiny corner of the Universe. 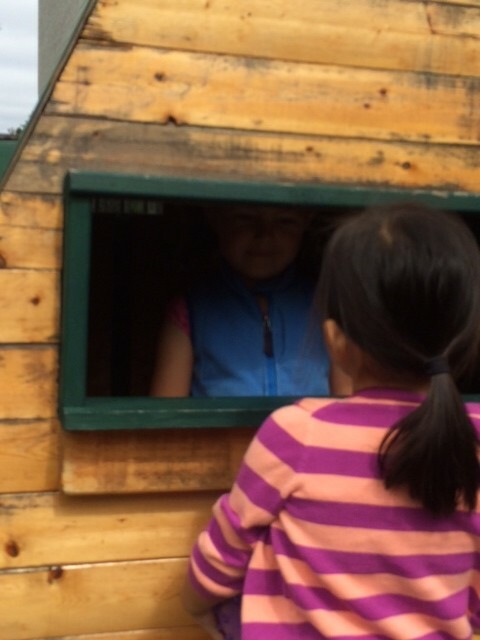 Exhibit is open at Gallup Park from 9:00am to 7:00pm, May 31 – June 1. 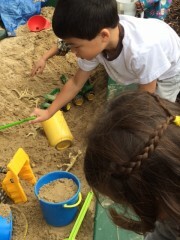 Rain dates are June 7-8.